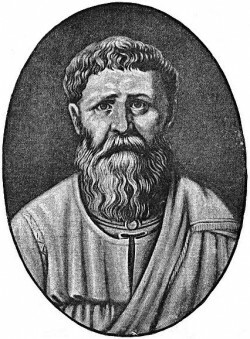 Augustine of Hippo (/ɔːˈɡʌstᵻn/; 13 November 354 – 28 August 430) was an early Christian theologian and philosopher whose writings influenced the development of Western Christianity and Western philosophy. He was the bishop of Hippo Regius (within modern-day Annaba, Algeria), located in Numidia (Roman province of Africa). Augustine is viewed as one of the most important Church Fathers in Western Christianity for his writings in the Patristic Era. Among his most important works are The City of God and Confessions. According to his contemporary, Jerome, Augustine "established anew the ancient Faith. "[note 1] In his early years, he was heavily influenced by Manichaeism and afterward by the neo-Platonism of Plotinus. After his baptism and conversion to Christianity in 386, Augustine developed his own approach to philosophy and theology, accommodating a variety of methods and perspectives.Believing that the grace of Christ was indispensable to human freedom, he helped formulate the doctrine of original sin and made seminal contributions to the development of just war theory. When the Western Roman Empire began to disintegrate, Augustine developed the concept of the Church as a spiritual City of God, distinct from the material Earthly City. His thoughts profoundly influenced the medieval worldview. The segment of the Church that adhered to the concept of the Trinity as defined by the Council of Nicaea and the Council of Constantinople closely identified with Augustine's On the Trinity. Augustine is recognized as a saint in the Catholic Church, the Eastern Christian Church, and the Anglican Communion and as a preeminent Doctor of the Church. He is also the patron of the Augustinians. His memorial is celebrated on 28 August, the day of his death. Augustine is the patron saint of brewers, printers, theologians, the alleviation of sore eyes, and a number of cities and dioceses. Many Protestants, especially Calvinists and Lutherans, consider him to be one of the theological fathers of the Protestant Reformation due to his teachings on salvation and divine grace. Lutherans, and Martin Luther in particular, have held Augustine in preeminence (after the Bible and St. Paul). Luther himself was a member of the Order of the Augustinian Eremites (1505-1521). In the East, some of his teachings are disputed and have in the 20th century in particular come under attack by such theologians as John Romanides. But other theologians and figures of the Eastern Orthodox Church have shown significant appropriation of his writings, chiefly Georges Florovsky. The most controversial doctrine surrounding his name is the filioque, which has been rejected by the Orthodox Church. Other disputed teachings include his views on original sin, the doctrine of grace, and predestination. Nevertheless, though considered to be mistaken on some points, he is still considered a saint, and has even had influence on some Eastern Church Fathers, most notably Saint Gregory Palamas. In the Orthodox Church his feast day is celebrated on 28 August. Church scholar and historian Diarmaid MacCulloch writes "his impact on Western Christian thought can hardly be overstated; only his beloved example Paul of Tarsus, has been more influential, and Westerners have generally seen Paul through Augustine's eyes." Augustine of Hippo (/ɔːˈɡʌstᵻn/, /əˈɡʌstᵻn/, or /ˈɔːɡʌstᵻn/; Latin: Aurelius Augustinus Hipponensis;[note 2] 13 November 354 – 28 August 430), also known as Saint Augustine, Saint Austin, (/ˈɔːstᵻn/ or /ˈɑːstᵻn/), is known by various cognomens throughout the Christian world across its many denominations including Blessed Augustine, and the Doctor of Grace (Latin: Doctor gratiae). He was an early Christian theologian and philosopher whose writings influenced the development of Western Christianity and Western philosophy. Augustine was the bishop of Hippo Regius (within modern-day Annaba, Algeria), located in Numidia (Roman province of Africa). He is viewed as one of the most important Church Fathers in Western Christianity for his writings in the Patristic Era. Among his most important works are The City of God and Confessions. Augustine was born in the year 354 AD in the municipium of Thagaste (now Souk Ahras, Algeria) in Roman Africa. His mother, Monica or Monnica, was a devout Christian; his father Patricius was a Pagan who converted to Christianity on his deathbed.Scholars generally agree that Augustine and his family were Berbers, an ethnic group indigenous to North Africa, but that they were heavily Romanized, speaking only Latin at home as a matter of pride and dignity. In his writings, Augustine leaves some information as to the consciousness of his African heritage. For example, he refers to Apuleius as "the most notorious of us Africans," to Ponticianus as "a country man of ours, insofar as being African," and to Faustus of Mileve as "an African Gentleman." The earliest known portrait of Saint Augustine in a 6th-century fresco, Lateran, Rome. Although Augustine showed some fervour for Manichaeism, he was never an initiate or "elect", but an "auditor", the lowest level in the sect's hierarchy. While still at Carthage a disappointing meeting with the Manichaean Bishop, Faustus of Mileve, a key exponent of Manichaean theology, started Augustine's scepticism of Manichaeanism. In Rome, he reportedly turned away from Manichaeanism, embracing the scepticism of the New Academy movement. Because of his education, Augustine had great rhetorical prowess and was very knowledgeable of the philosophies behind many faiths. At Milan, his mother's religiosity, Augustine's own studies in Neoplatonism, and his friend Simplicianus all urged him towards Christianity. Initially Augustine was not strongly influenced by Christianity and its ideologies, but after coming in contact with Ambrose of Milan, Augustine reevaluated himself and was forever changed. Like Augustine, Ambrose was a master of rhetoric, but older and more experienced. Augustine was very much influenced by Ambrose, even more than by his own mother and others he admired. Augustine arrived in Milan and was immediately taken under the wing by Ambrose. Within his Confessions, Augustine states, "That man of God received me as a father would, and welcomed my coming as a good bishop should." Soon, their relationship grew, as Augustine wrote, "And I began to love him, of course, not at the first as a teacher of the truth, for I had entirely despaired of finding that in thy Church—but as a friendly man." Augustine visited Ambrose in order to see if Ambrose was one of the greatest speakers and rhetoricians in the world. More interested in his speaking skills than the topic of speech, Augustine quickly discovered that Ambrose was a spectacular orator. Eventually, Augustine says that he was spiritually led into the faith of Christianity. Augustine's mother had followed him to Milan and arranged a marriage for him. Although Augustine accepted this marriage, for which he had to abandon his concubine, he was deeply hurt by the loss of his lover. He wrote, "My mistress being torn from my side as an impediment to my marriage, my heart, which clave to her, was racked, and wounded, and bleeding." Augustine confessed that he was not a lover of wedlock so much as a slave of lust, so he procured another concubine since he had to wait two years until his fiancée came of age. However, his emotional wound was not healed, even began to fester. The Conversion of St. Augustine By Fra Angelico. In 395 he was made coadjutor Bishop of Hippo, and became full Bishop shortly thereafter, hence the name "Augustine of Hippo"; and he gave his property to the church of Thagaste. He remained in that position until his death in 430. He wrote his autobiographical Confessions in 397–398. His work The City of God was written to console his fellow Christians shortly after the Visigoths had sacked Rome in 410. Augustine was not preoccupied, as Plato and Descartes were with going too much into details in efforts to explain the metaphysics of the soul-body union. It sufficed for him to admit that they are metaphysically distinct: to be a human is to be a composite of soul and body, and the soul is superior to the body. The latter statement is grounded in his hierarchical classification of things into those that merely exist, those that exist and live, and those that exist, live, and have intelligence or reason. Like other Church Fathers such as Athenagoras, Tertullian, Clement of Alexandria and Basil of Caesarea, Augustine "vigorously condemned the practice of induced abortion", and although he disapproved of an abortion during any stage of pregnancy, he made a distinction between early abortions and later ones. He acknowledged the distinction between "formed" and "unformed" fetuses mentioned in the Septuagint translation of Exodus 21:22-23, which is considered as wrong translation of the word "harm" from the original Hebrew text as "form" in the Greek Septuagint and based in Aristotelian distinction "between the fetus before and after its supposed 'vivification'", and did not classify as murder the abortion of an "unformed" fetus since he thought that it could not be said with certainty that the fetus had already received a soul. Augustine held that "the timing of the infusion of the soul was a mystery known to God alone". However, he considered procreation as one of the goods of marriage; abortion figured as a means, along with drugs which cause sterility, of frustrating this good. It lay along a continuum which included infanticide as an instance of ‘lustful cruelty’ or ‘cruel lust.’ Augustine called the use of means to avoid the birth of a child an ‘evil work:’ a reference to either abortion or contraception or both." Because of "the defective science of his day", Bishop Robert F. Vasa claims that Augustine would be convinced that an "unformed" fetus had already received a soul "if Augustine had access to ultrasound images or if he had seen the film, The Silent Scream." In City of God, Augustine rejected both the immortality of the human race proposed by pagans, and contemporary ideas of ages (such as those of certain Greeks and Egyptians) that differed from the Church's sacred writings. In The Literal Interpretation of Genesis, Augustine took the view that everything in the universe was created simultaneously by God, and not in seven calendar days like a literal interpretation of Genesis would require. He argued that the six-day structure of creation presented in the Book of Genesis represents a logical framework, rather than the passage of time in a physical way – it would bear a spiritual, rather than physical, meaning, which is no less literal. One reason for this interpretation is the passage in Sirach 18:1, creavit omnia simul ("He created all things at once"), which Augustine took as proof that the days of Genesis 1 had to be taken non-literally. Augustine also does not envision original sin as causing structural changes in the universe, and even suggests that the bodies of Adam and Eve were already created mortal before the Fall. Apart from his specific views, Augustine recognizes that the interpretation of the creation story is difficult, and remarks that we should be willing to change our mind about it as new information comes up. St. Augustine by Carlo Crivelli. Augustine originally believed in premillennialism, namely that Christ would establish a literal 1,000-year kingdom prior to the general resurrection, but later rejected the belief, viewing it as carnal. He was the first theologian to expound a systematic doctrine of amillennialism, although some theologians and Christian historians believe his position was closer to that of modern postmillennialists. The mediaeval Catholic church built its system of eschatology on Augustinian amillennialism, where Christ rules the earth spiritually through his triumphant church. Although Augustine did not develop an independent Mariology, his statements on Mary surpass in number and depth those of other early writers.Even before the Council of Ephesus, he defended the ever Virgin Mary as the Mother of God, who, because of her virginity, is full of grace.Likewise, he affirmed that the Virgin Mary "conceived as virgin, gave birth as virgin and stayed virgin forever." Portrait by Philippe de Champaigne, 17th century. They would not have fallen into pride and lack of wisdom, if Satan hadn't sown into their senses "the root of evil" (radix Mali). Their nature was wounded by concupiscence or libido, which affected human intelligence and will, as well as affections and desires, including sexual desire. [note 5] In terms of metaphysics, concupiscence is not a being but bad quality, the privation of good or a wound. St. Augustine by Peter Paul Rubens. The view that not only human soul but also senses were influenced by the fall of Adam and Eve was prevalent in Augustine's time among the Fathers of the Church. It is clear that the reason for Augustine's distancing from the affairs of the flesh was different from that of Plotinus, a neo-Platonist[note 6] who taught that only through disdain for fleshly desire could one reach the ultimate state of mankind.Augustine taught the redemption, i.e. transformation and purification, of the body in the resurrection. Scholars are divided over whether Augustine's teaching implies double predestination, or the belief that God chooses some people for damnation as well as some for salvation. Catholic scholars tend to deny that he held such a view while some Protestants and secular scholars have held that Augustine did believe in double predestination. Some Protestant theologians, such as Justo L. González:44 and Bengt Hägglund, interpret Augustine's teaching that grace is irresistible, results in conversion, and leads to perseverance. Augustine led many clergy under his authority at Hippo to free their slaves "as an act of piety." He boldly wrote a letter urging the emperor to set up a new law against slave traders and was very much concerned about the sale of children. Christian emperors of his time for 25 years had permitted sale of children, not because they approved of the practice, but as a way of preventing infanticide when parents were unable to care for a child. Augustine noted that the tenant farmers in particular were driven to hire out or to sell their children as a means of survival. In his book, The City of God, he presents the development of slavery as a product of sin and as contrary to God's divine plan. He wrote that God "did not intend that this rational creature, who was made in his image, should have dominion over anything but the irrational creation – not man over man, but man over the beasts." Thus he wrote that righteous men in primitive times were made shepherds of cattle, not kings over men. "The condition of slavery is the result of sin," he declared. In The City of God, Augustine wrote he felt slavery was not a punishment. He wrote: "Slavery is not penal in character and planned by that law which commands the preservation of the natural order and forbids disturbance." 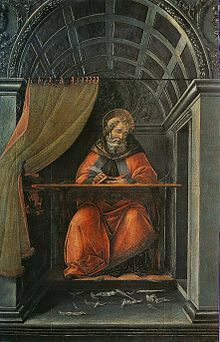 Saint Augustine in His Study by Sandro Botticelli, 1494, Uffizi Gallery. Augustine is considered an influential figure in the history of education. 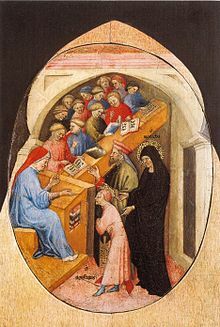 A work early in Augustine's writings is De Magistro (On the Teacher), which contains insights about education. His ideas changed as he found better directions or better ways of expressing his ideas. 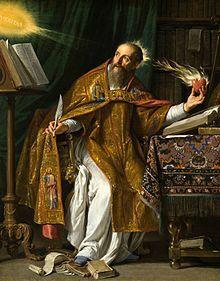 In the last years of his life Saint Augustine wrote his Retractationes, reviewing his writings and improving specific texts. Henry Chadwick believes an accurate translation of "retractationes" may be "reconsiderations". Reconsiderations can be seen as an overarching theme of the way Saint Augustine learned. Augustine's understanding of the search for understanding/meaning/truth as a restless journey leaves room for doubt, development and change. 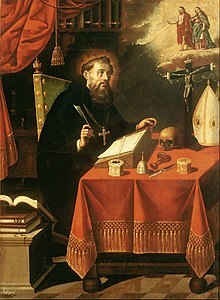 Saint Augustine painting by Antonio Rodríguez. 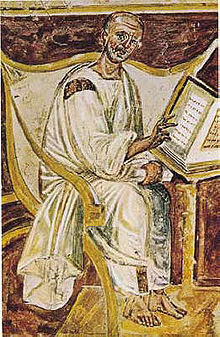 Apart from those, Augustine is probably best known for his Confessions, which is a personal account of his earlier life, and for De civitate Dei (The City of God, consisting of 22 books), which he wrote to restore the confidence of his fellow Christians, which was badly shaken by the sack of Rome by the Visigoths in 410. His On the Trinity, in which he developed what has become known as the 'psychological analogy' of the Trinity, is also considered to be among his masterpieces, and arguably one of the greatest theological works of all time. He also wrote On Free Choice of the Will (De libero arbitrio), addressing why God gives humans free will that can be used for evil. 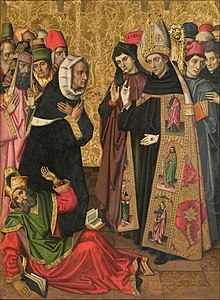 Saint Augustine Disputing with the Heretics painting by Verges Group. Martin Heidegger refers to Augustine's descriptive philosophy at several junctures in his influential work Being and Time. [note 9] Hannah Arendt began her philosophical writing with a dissertation on Augustine's concept of love, Der Liebesbegriff bei Augustin (1929): "The young Arendt attempted to show that the philosophical basis for vita socialis in Augustine can be understood as residing in neighbourly love, grounded in his understanding of the common origin of humanity." The Consecration of Saint Augustine by Jaume Huguet. Augustine was played by Dary Berkani in the 1972 television movie Augustine of Hippo. He was played by Franco Nero in the 2010 mini-series Augustine: The Decline of the Roman Empire and the 2012 feature film Restless Heart: The Confessions of Saint Augustine.The modern-day name links to the Agostinelli family.